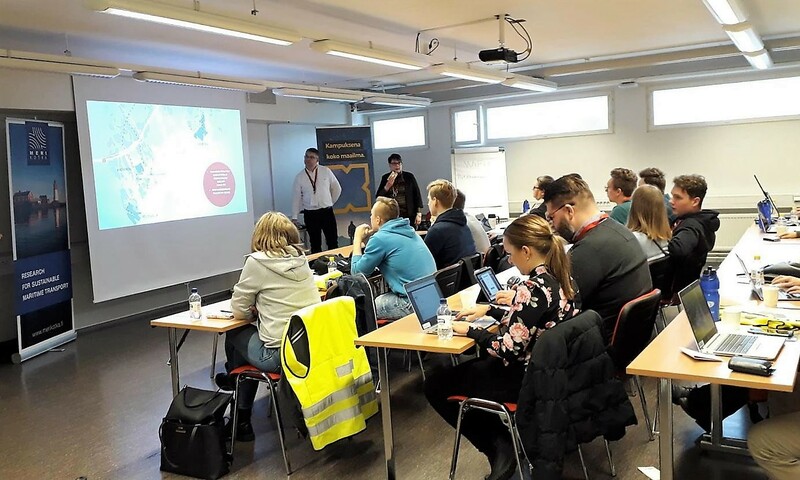 DigiPort project organized the Hack the Port hackathon in Mussalo Port, Kotka, 9-11 April. Hackathon is a problem-solving event where teams of students try to develop new, innovative solutions to the challenges of everyday life. The theme of Hack the Port was to streamline port operations through digitalization and open data. 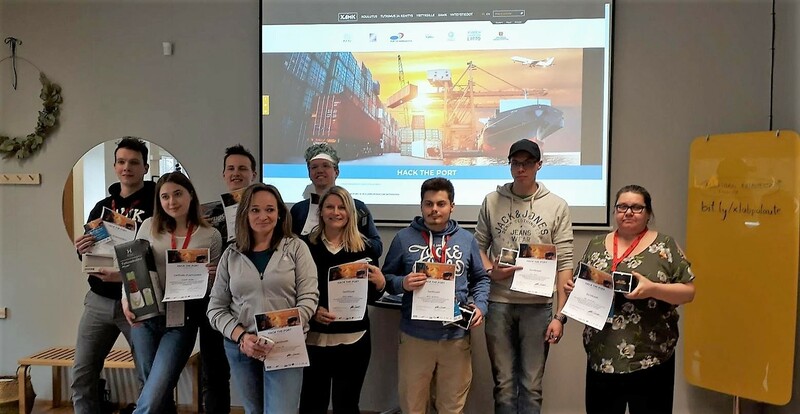 The event was opened on Tuesday morning at 9.4. by mrs. Eija Rossi, Commercial Director of HaminaKotka Satama Oy, at the Merituuli office center of the port of Mussalo. Eija Rossi introduced port company operations and role, and emphasized the need for new ideas and solutions in the port industry. After the opening, there was an observation tour in the port area of ​​Mussalo. On the tour, the teams saw in concrete terms what was happening in the port and heard the views of different actors. At the same time, they had the opportunity to ask questions. The tour started with a general introduction by Ville Kuitunen of HaminaKotka Satama Oy, after which VR Transpoint Oy’s Jani Liikanen told about the organization and challenges of rail traffic in the port. The next step was the container terminal, where Steveco Oy’s Mikko Raki introduced container operations and the underlying information systems. Finally, we visited the liquid harbor where Suvi-Tuuli Lappalainen from Oiltanking Finland Oy introduced chemical operations and safety issues. 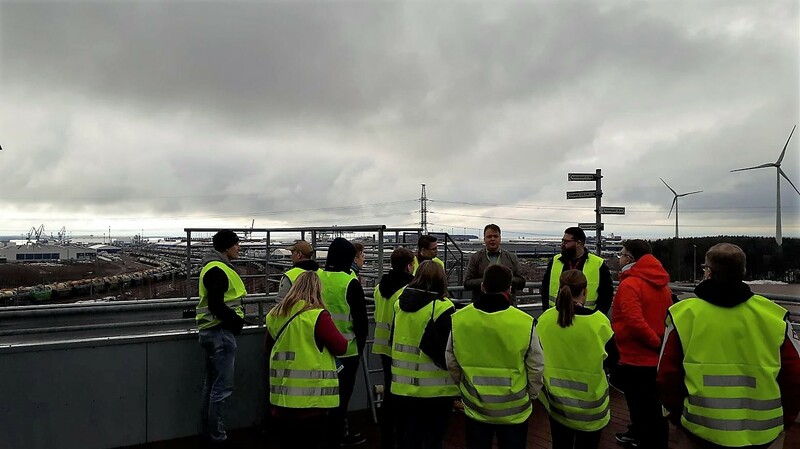 To solve the challenges, students had been provided with various background materials such as links to open data guides and databases, and research data from the DigiPort project workshops in spring 2018 in Kotka and Turku. Work started at the Merituuli office center was continued in the Villa Aava in the nearby Santalahti Resort. Teams worked overnight and the day changed on Wednesday 10.4. At noon, the teams spread apart to finish their work independently. Thursday morning 11.4. they met in the center of Kotka in XAMK Xlab. Teams were offered pitch training for a smooth and interesting presentation of solution ideas. Teams were also able to practice in front of the test jury. On the basis of the feedback received from them, the teams finished their final performances. In the afternoon, the actual pitching and award ceremony took place. Hackathon jury included Research Director Maria Hänninen from Merikotka, Logistics Manager Olli-Pekka Brunila from XAMK, Sales Manager Ville Kuitunen from HaminaKotka Satama Oy and Project Manager Antti Viitanen from *ship Startup Festival. Team PowerSquare was chosen as the winning team. Their idea was to streamline port road traffic by digitizing the driving instructions to the port. Moving around in the port area is often perceived as confusing and navigation may not be successful with standard navigation applications. At the moment, drivers are getting a paper map at the gate for instructions to deliver their cargo. In Team PowerSquare application, drivers are sent an e-mail with an information package that includes driving instructions and information about the area’s security arrangements and services. Second came Team Jaa-a. Their solution was also related to traffic management by processing data from port entry gates and data from open road data sources. The goal is to avoid peaks and to ensure that the available capacity of the port area road network is not exceeded. The third place was divided between two teams. The idea of ​​the “SH Double” team “Connecting Port People” brought a human-centered perspective on port digitalization. It was a construction of a new digital ecosystem for the port community. The Hak5 team’s output was a machine-vision-based traffic control and management solution. The atmosphere of the award ceremony with Xlab. Award-winning teams have the opportunity to refine their ideas and present them to mentors and funders at the *Ship Startup Festival.